Steve is a longtime Trakkers member and a dedicated ski instructor for many years. He shares his advices based on observing and teaching beginner skiers. 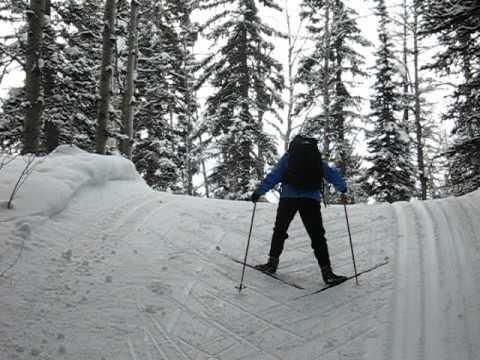 Cross-country skiing is an accessible winter sport and a few tricks makes a big difference to enjoy the glide. The opposing force on the upper body naturally projects it forward over the glide ski. Weight transfer is more complete. Timing of the pole action with the skis is smoother and rhythmic. Correct poling action, timing, balance and posture are learned at the beginning and committed to motor muscle memory. It is much more difficult to modify motor muscle memory later if the student develops bad habits. This entry was posted in Tips, XC Skiing on March 24, 2019 by lauresabatier. Gillian is a long-time cross-country skier. She joined Trakkers this season after many years of cross-country skiing at Kawartha Nordic with her family. Read about their second visit back to this idyllic park with the club. On our second Trakkers trip to Kawartha Nordic, it was Family Day weekend. My mother used to live next to this non-profit community-run ski club. 20 years ago, all members volunteered, and they used to spend two weekends a year as “cabin keepers” starting and tending the fire in what used to be a small trailhead cabin. With growth in community, and new resources from partners and Trillium Foundation, the club has grown. But it maintains a distinct non-commercial feel. My daughter (17) agreed to come along. She joined our regular Trakkers gang – myself, my partner, my son (13), and his school friend (who keeps pace with us after just two lessons through the club). And the gang was larger as we also skied with another Trakkers member and her son (14) who we had met on our first Sunday trip. There was fresh snow, and lots of energy as we set out on the trails. My kids learned to ski here, on the easier Beaver and Kawartha trails, but we headed straight to our favorite intermediate trail: Red Fox. This trail is narrow and isolated, following slight winds, dips and rises. We are spellbound again by the exquisite sunlight cast through the trees. It is 1km of heaven, between two of the larger routes in the 46km trail network. We usually ski to our favorite Laderach cabin (we like the classic trails around there), but today we had ventured farther to the Tanney cabin. Both cabins stock birdseed so skiers can commune with local winged creatures. All three boys spent their entire lunch outside, feeding the delightful soft-bellied chickadees and nuthatches. The return trail was a slight downhill most of the way, so we glided back quicker than expected. … despite irresistible stops for nature pics. With time to spare, the youth in our gang sought the thrills of downhill: my daughter hit the informal toboggan hill near the main cabin, and the boys headed to a newer switchback trail called “the hills”. We adults couldn’t resist a return loop to run the Red Fox … yet again. As time neared 4pm, all Trakkers skiers converged towards the two-storey trailhead cabin. Outside, some members sunned on the porch. While inside, others sat around the wood stoves. I enjoyed a snack huddle with the kids, while we perched on homey, member-built tree-trunk stools. It was a perfect wind-down to an energetic day. On the bus home, we continued to snack, in style with our cheese and fruit tray. Then, most of the bus dozed off and I got back into my second read of a fine book set in a fictional country of beautiful East Africa. I enjoyed immersing myself in the sensuously described paysage. Of course, returning from another ski Sunday with Trakkers in the “rugged Canadian Shield at its wintery best” … I couldn’t be envious at all. This entry was posted in Sunday Trips, Things of Interest on March 7, 2019 by lauresabatier. Trakkers offers free lessons to members and guests. Lessons range from absolute beginners to advanced skiers, for classic skiing and skating. CANSI (Canadian Association of Nordic Ski Instructors) certified instructors provide lessons on Sunday Trips. 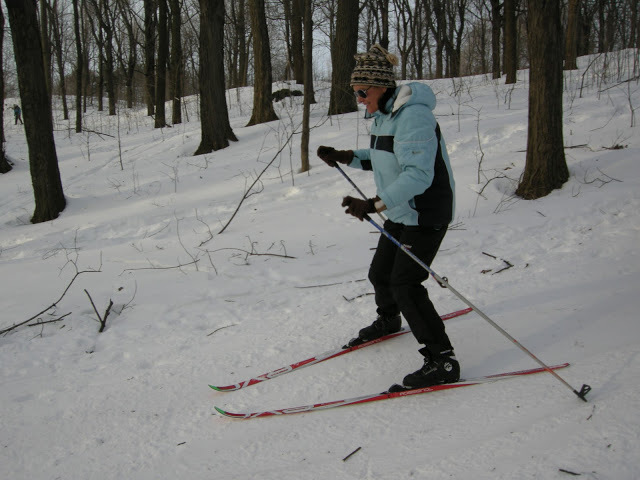 Sylvia has been an instructor for many year and tell about her latest Beginner Hill Lesson. Sunday, January 20 was a cold day for Trakkers who headed to Hardwood Hills Ski and Bike. I was happy to have five keen students for my Beginner Hill Lesson despite the -34° wind chill! Because everyone was at different levels, we started on a very small hill. Getting the right body stance was important to practise to build confidence. We gradually moved to snowplows. We didn’t move to higher hill until everyone was comfortable. The benefit of having a lesson dedicated to hills is there is plenty of time to practise. In addition to the many skills learned, we all managed to stay warm for the 75-minute lesson! The special moment came when everyone skied snow plow and snowplow turn on a higher hill. Applause and cheers rang out for an absolute beginner who clearly made the most progress. If you’re hesitant on hills, sign up for the Beginner Hill lesson. With the guidance of your instructor, working at your comfort level and having lots of time to practise you will feel the difference! Learn more about the ski lessons and tips to ski at trakkers.ca/lessons. This entry was posted in Sunday Trips, XC Skiing on January 30, 2019 by lauresabatier. Niki has been a Trakkers member for a number of years and is a first-time bus captain volunteer! Chocolate Date Balls are sweetened with medjool date paste so they’re free from refined sugar. Easy, no-bake, vegan recipe with just 6 ingredients! Add dates to water, cover with plastic wrap and set aside for 5-10 minutes. This softens the dates and makes them easier to puree. It’s not necessary if the dates are very soft. Remove dates from water and place in a small food processor along with 1 Tablespoon of water that the dates soaked in. Pulse until smooth, scraping down the sides as necessary. Add additional water to thin the consistency of the paste, if desired. Combine oatmeal, cocoa powder and coconut flakes in a medium sized bowl. Add date paste, vanilla extract and almond butter to the dry mixture. Stir to combine all of the ingredients. Form dough into Tablespoon-size balls. Refrigerate balls in an air tight container. This entry was posted in Strong Trakker, Sunday Trips, Tips on January 12, 2019 by lauresabatier. Gillian is a long-time cross-country skier. She recently joined Trakkers Cross-country Ski Club with her family for the simplicity offered by the bus ride. Read about their first day with Trakkers. Do you know that feeling of being so happy in an experience… and somehow in the middle of that bliss, when nothing else matters, just wanting to break out and invite others to experience the same? Having it all is not always enough: sharing it all also matters. My first trip as a new Trakkers member brought me that feeling, along with the fullness of having joined a community where the sharing of winter bliss is central to the values and workings of a club. My family are long-time cross-country skiers. My mother converted me (from downhill) to the trails when she discovered cross-country, and I was 12. Since adolescence, I have skied enthusiastically with my family of origin, my (and my siblings’) next-generation families, and many friends. Still, my ski community just expanded so simply and so delightfully with joining Trakkers this past fall. For decades, living car-free in Toronto meant that ski days depended on that occasional good dump of snow on a weekend (when we are able to enjoy our local ravine) or a weekend trip involving car rental, overnight packing and preparations (that was always worth the energy, but not repeatable at high frequency). I first found Trakkers online when the subway only opened at 9am on Sundays, and the Trakkers bus left at 9am. The subway’s fairly recent change to an 8am start changed everything in principle. This year, I finally got organized in practice. And so with my partner, and our 13 year old, I joined in on the first Trakkers Sunday trip of the 2018-19 season. That morning bus took us to Scenic Caves resort, on a mountaintop close to Collingwood where all the trails were open and perfect, entirely heedless to the grey monotone we left behind in Toronto. To top it off, we won the lottery when I met a young grade 9 student on the bus who had been skiing with his mom through Trakkers for two years, and we hooked up with them for a full day of skiing – all five of us with similar skills, stamina, and delight! Meanwhile, I was equally delighted to meet the many members on the bus who were not of my skill level. A total of 17 beginner and absolute beginner skiers signed up for the free lessons that day! Witnessing this showed me a whole other side to the club: how the teaching and learning of new skills is central to Trakkers culture. I also learned that there are opportunities to hone my skills and get certified to share my cross-country ski passion with the many newcomers to this lifelong sport. Trakkers’ commitment to teaching, learning and enjoyment of skiing in the woods, without any competitive focus, is unusual and inspiring. On the way home, it was hard to contain my excitement amidst a rather quiet bus culture …but that aspect of the club did make for a very restful trip home: in the dark, many of us napping, taking full advantage of our professional driver. Back in the city, my feelings of vigour and happiness lasted days longer than my muscle aches. I have since invited both seasoned skiers and newcomer winter enthusiasts to join us as guests on a Sunday. …And here is my more public call-out to other families with teens who, when pulled from their screens, might get into the zone: both those who already know the route to a well-earned black-diamond-downhill, and those who would aspire to it after a few lessons and a few fun Sundays in the snow. Experience this aliveness with us on a coming weekend! This entry was posted in Strong Trakker, Sunday Trips on January 5, 2019 by lauresabatier. Stefan and Vera arrived from Germany a few months ago, with their two children. They became members of Trakkers Ski Club to experience a local winter outdoors activity. Read about their first adventure with the club as they participated in the Sunday trip of December 16. Absolute cross-country beginners, brand-new with Trakkers, and just a few months into Canada: Saturday evening, we scratched our heads whether we had every form filled correctly (we didn’t), all the gear ready (mostly), and enough food stocked up to survive Canadian winter (just so). What a brilliant experience this was – for all four of us! Finding the bus was no problem at all. Getting the kids out of bed on a Sunday morning may still need some practice. The bus ride itself was a breeze with a few friendly chats along the way. I haven’t travelled in a bus for years. Sitting in the last row brought up memories from long past school outings where the last row was the place to be. Travelling with kids, we were also quite relaxed to find that there’s a washroom on the bus, and an electric plug for smartphone people, and even cup holders (just not for oversized refillable venti thermos cups). Slowly nibbling away on our food supplies, we enjoyed watching the landscape flying by, and getting whiter and whiter. The bus ride was convenient, it was a pure luxury on the way back with sore muscles and pleasantly tired. Finally, we arrived at Scenic Caves – what a beautiful winter day. We quickly grabbed our gear and kids (and figured out we could leave some stuff in the bus and in the log cabin). So, beginners we are and enrolled in Xavier’s beginner’s course. A very good decision, even as proficient downhillers, to learn the basic cross-country was essential, and big fun as well. Xavier is a brilliant instructor and took us through snow ploughs and quick steps along the tracks, and even recruited some of the other skiers coming by to demonstrate how going down a little hill. After this, we moved around far from elegant but felt sufficiently prepared to explore the easy peasy lemon squeezy tracks through the forest. What a difference to our downhill experiences in the European Alps where slopes can get pretty crowded. We enjoyed the peace, wondered about animal tracks in the snow, and experienced a nice blend of sweat (uphill) and adrenaline (downhill). Easy peasy track, but expressive map-style. This was fun. We are so glad we joined at the start of the season, and will surely be back as often as possible. Every one of us, had their little successes and learning opportunities, and when we stepped back into the bus, we were tired and joyful. What a beautiful day. Thank you, Trakkers. Note to ourselves: Add sunglasses next time. Bring even more drinks. Remember to take the improvised toboggans again for the kids, and bring more books. This entry was posted in Strong Trakker, Sunday Trips on December 21, 2018 by lauresabatier. Sunday, August 26th* 10:30 a.m. – 6:00 p.m.
A guided bike tour encircling Hamilton and Burlington, with stops at historic sites such as the Hamilton Lift Bridge, the Beach Canal Lighthouse, H.M.C.S. Haida, and Dundurn Castle. This is a trip designed for Trakker members with at least moderate cycling experience. Options also available include driving a Go Kart and a post-tour supper. This moderately-paced bike tour will travel on both pavement and hard-packed trails as well as on paved roads and streets, many with designated bike lanes. The total distance is approximately 40 km., broken into 7 segments. Although much of the route is relatively flat, there are 4 uphill grades which can be walked if need be. A water bottle and sunscreen are highly recommended. The bike shelter in the South Parking Lot of Aldershot GO station. If you don’t have a car, our tour is scheduled around the GO train leaving Toronto’s Union Station† at 9:13 a.m. and a return train departing Aldershot’s GO Station at 6:31 p.m. Most of the train’s coaches have places for two (and sometimes four) bicycles. * In case of a heavy rain forecast for Sunday, August 26th, our alternate date is Sunday, September 9th. † Please note that this is the regularly scheduled train which may be boarded at stations other than Toronto’s Union Station. For full details of train times and station stops, see the schedule and for the cost of the return train fare, see GO Transit’s fare calculator. Participants will be asked to sign a waiver. This entry was posted in Uncategorized on June 3, 2018 by lauresabatier.